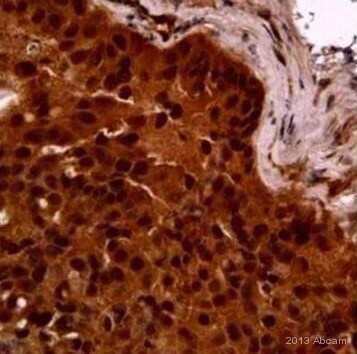 The antibody (ab10972) you have suggested is the one I originally used and it did not work. I need you to suggest another one which is not raised in rabbit but is also not the one I have already bought! Thank you for your reply. I have now returned to the office an hope I can help further with your enquiry. I can now confirm that of the antibodies we have directed against VEGF Receptor 2 (that are not raised in rabbit), most likely to react with the sheep protein are the mouse monoclonals ab10972, ab10973 and ab82266. This is based on the immunogen used to raise these antibodies. They have all be raised against the extracellular domain of the VEGF Receptor 2, however, this region covers the residues 1-745 and as I only have the region between 230-400 of the sheep protein to compare I cannot be at all certain that they will work, as you have observed with ab10972. We have ourselves not tested any of these antibodies with samples from sheep and therefore cannot guarantee their performance. However, I would suggest the rabbit antibodies I suggested, ab39521, ab62697, ab63613 and ab131510 (especially ab131510 as it has been used in ICC/IF as well as staining of paraffin embedded sections) would be more likely to work with your samples. Again, if you would like to participate in the Abtrial with any of these antibodies please do let me know. I hope this information has been of some help. If I can be of any further assistance, please do not hesitate to let me know. Thank you for your reply. I have now checked through the antibodies we have directed against VEGF Receptor 2 and the likelihood that any of them will be able to cross react with the protein in your sheep samples. The two fragments of sequence from SwissProt (http://www.uniprot.org/uniprot/Q8MI25 and http://www.uniprot.org/uniprot/Q8MI23) align to ˜230-400 and 1020-1200 of human and mouse VEGF Receptor 2 respectively. From this, I have been able to identify a total of 4 antibodies that would be likely to cross react. These are ab39521, ab62697, ab63613 and ab131510. Of these I think the antibody ab131510 would be most worthwhile to try as this has been used in ICC/IF as well as staining of paraffin embedded sections. As discussed, I would be willing to provide you with ab131510 for you free of charge if you would be interested as a gesture of goodwill. In return, I would appreciate it if you would provide an Abreview once you have used the antibody. This should only take 5-10 minutes to complete. I cannot provide you with ab10972 as initially discussed as I would not be as sure of its reactivity due to the immunogen used to raise the antibody not being within the fragments we have for the sheep protein. I hope this information has been of help. I look forward to hearing how you would like to proceed. I would like you torecommendIsotyp control ab to these two ab?